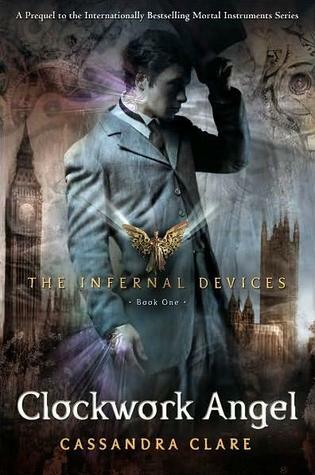 I am a huge fan of Cassandra Clare’s Mortal Instruments series (as determined by this earlier review of the first book in that series, City of Bones). So I hang my head in shame as I reveal that the first book in her newest series, a prequel to the other one, was read by me only recently—and it came out on August 31st of last year. I don’t know, maybe I didn’t want to break the spell that was cast by what has become one of my favorite series of all time. I was so scared that this new book wouldn’t live up to the others, and since it is set in the same world (albeit over a hundred years prior and in London, not New York), I didn’t want that awesome world tarnished in any way. Finally though, itching for something to read, I picked it up, and I couldn’t have been more wrong. If anything, I liked this book better than the first series, which I still find hard to believe since I love those books so much. But Clare knows what she’s doing, and this book blew me away. I’m not going to go over the logistics of the world she created, as I already explained them in my previous review (check it out here if you’re unfamiliar with the books). I’m just going to hop into the story. Tessa, an American, sails to London at the request of her brother who has been living there. Upon arriving she is intercepted by two older women known as the Dark Sisters, who say they are taking her to her brother, but instead take her to their home and hold her captive there. For she has a special skill, one that needs to be drawn out of her. Tessa has the ability to shape shift into another person, alive or dead, as long as she is holding something of theirs. They are preparing her to marry someone known only as The Magister, who wants her powers for himself and his nefarious purposes. Terrified, she tries in vain to escape, but in the end it doesn’t matter, as she’s rescued by a Shadowhunter named Will. He takes her into the world of the London Demon-killers, and as they try to learn about her and what she is, she wants nothing else than to find her brother, who has seemed to have disappeared in the mix of all this. Throw in the mystery of some clockwork people, local vampires, and a certain warlock loved from the original series, and this book was simply un-put-downable. It is not news that I have recently developed an interest in Steampunk, and at the end of the day it was these elements that made me finally decide to pick up the book in the first place. From the beginning of the book to its very last pages Clare weaves clockwork devices in so smoothly that it is hard to imagine such things didn’t commonly exist back in the late 1800’s. And though the book is enough of a stand-alone adventure to let the reader feel satisfied at the end, there are enough clues well-planted that I cannot wait for the next book in this series. Clare also makes this series one that I believe both sexes can enjoy. There is a female protagonist, and definitely some great sexual tension which the girls seem to be particularly keen on, but the adventure and the characters are the primary driving force, and I truly believe this world that the author has created will appeal to readers across the board. Her 4th book in the Mortal Instruments series is coming out in April, and I’ll read it and I’m sure I’ll enjoy it. Really though it will just be tiding me over until the next book in this series comes out. Her writing is smooth, simple, and devourable. Just how I like it.